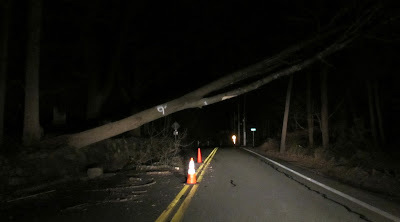 This tree loomed over a local road for at least a week. Finally, a real excuse for not updating the blog in a while - Superstorm Sandy took out my electricity for the better part of two weeks. Conditions weren't really bad for me - it was easy to get food and gasoline and I had plenty of friends who offered safe places to stay - but there are still tens of thousands suffering in the New York metropolitan area even though power has largely been restored. I've made some of my photos available for download with *all* proceeds going to nonprofits helping with storm-relief efforts. (I sent out the first donation from downloads to Food Bank for New York City today.) You can see the available photos here. There's a few animal shots - wolves, polar bears, and a langur - and a nice Costa Rican beach sunset. If you are interested in a download of another photo you see on the site, feel free to contact me about making it available for a charitable contribution. And of course you can always ignore the photos and just contribute to the nonprofit organization of your choice!